Never mind how well spoken you might be now, you will never again be as adept with languages as the day you were born. Indeed, the youngest person in any room is almost always the best linguist there too. There are 6,800 languages in the world, and since you can’t know where you’ll be born, you have to pop from the womb to be able to speak any one of them. That talent fades fast — as early as nine months after birth, some of our language synapses start getting pruned away. But well into your grammar-school years, your ability to learn a second — or third or fourth — language is still remarkable. That, it turns out, is very good for the brain. New studies are showing that a multilingual brain is nimbler, quicker, better able to deal with ambiguities, resolve conflicts and even resist Alzheimer’s disease and other forms of dementia longer. All of this is prompting public schools to implement language-immersion programs for kids as young as kindergarteners, as I report in the new issue of TIME; nowhere is that more evident than in Utah, where 20% of all public schools offer K-12 dual-language instruction, with students taking half their classes every day in English and half in either Spanish, French, Mandarin or Portuguese. To date, representatives from 22 other states have gone to Utah to learn more about the program. 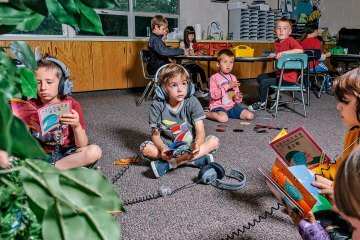 The kids in bilingual classes in Utah and elsewhere aren’t thinking much about the nature of their brains when they go to school each morning; they’re only aware of the rich and lyrical experience of living and learning bilingually. But scientists — particularly neurologists, psychologists and educational specialists — are watching closely. In a polyglot world, a largely monoglot nation like the U.S. is at last moving to catch up — and not a moment too soon.